Several months ago, when J and I still lived in Lansing, a follower of Mid-Michigan Dining emphatically suggested a pizza joint in Grand Haven. He said it was worth the drive and really thought the pizza fit the style of what we like. 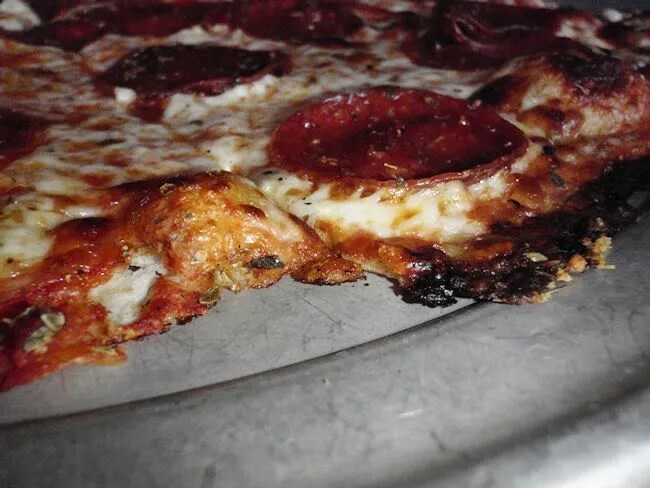 He’s from the East Coast, so his take on pizza is a little different than ours, but when we started hearing from other people about this place, our interest perked up. Unbeknown to us, there are actually a couple West Michigan locations of this restaurant and one of them happens to be in Kalamazoo. 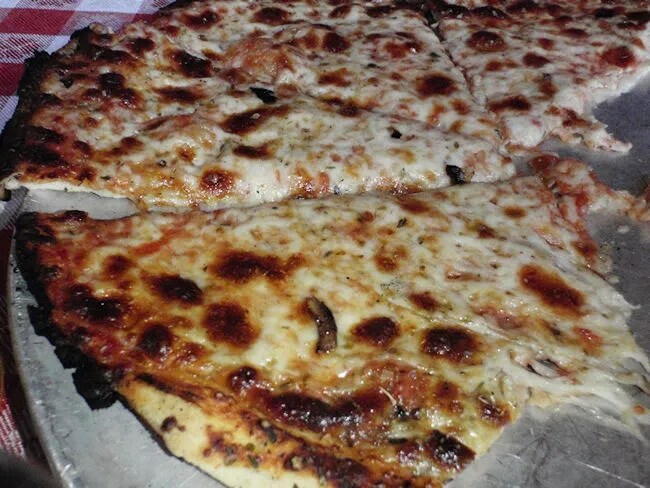 Fricano’s of Alamo is one of five Fricano’s Pizza locations. It’s on 6th Street in the northwest corner of Kalamazoo in Alamo Township. It’s somewhat in the middle of nowhere. Since I wasn’t familiar with the place, I plugged the address in the GPS. It took us Main Street to 6th Street. For five miles on 6th Street we drove through the hilly countryside. All of a sudden, the GPS was saying, “Destination on the right,” and we were not seeing anything. Once we got past the treeline, we found the restaurant out in the middle of the country all by itself. The parking lot was packed and there were people waiting outside underneath the awning. We figured then there might be a wait. It was 7:30 on a Friday night, so it wasn’t completely unexpected. I had heard the place was good and seeing that many people just reinforced that. We made our way into the restaurant to find a pretty large waiting area. There were a number of people lounging around along the walls and taking up the available bench space. We went to the hostess station to put our name in. It took a good five minutes if not more for a hostess to even acknowledge us. There was only one woman working as the host and she really could have used help. As we stood there, she took two groups to tables and each time, she was gone for more than five minutes. It was really frustrating and as we watched tables open up and sit empty for ten minutes or more while there were still several groups of people waiting to be seated, we contemplated coming back another time. We stuck it out though and right at the 25 minute mark, our name was called and we were taken to a table in the dining room along the windows which overlook the fields of rural Kalamazoo County. I happened to notice someone put a menu on the floor behind J. It was on top of the air vent, so someone obviously was cold, but we were both hot, so taking the menu off the vent made things better for us. It also helped because we weren’t acknowledged for almost ten minutes. The hostess didn’t bring menus with us when she took us to a table which seemed odd to me. The waitress for the table next to ours noticed us sitting there a little annoyed and asked if we had been helped. We said no and she went and got our waitress. Since we found the menu on the floor, we were ready to order when she got there. We didn’t know if this was going to be a pattern and really just wanted to get our order in. We both got Coke’s to drink and J started with a side salad. She also asked for bread and the waitress told her that bread didn’t come with our order because we weren’t getting an entree. J said that was fine, just bring the bread. The salad, drinks, and bread came out a few minutes later. 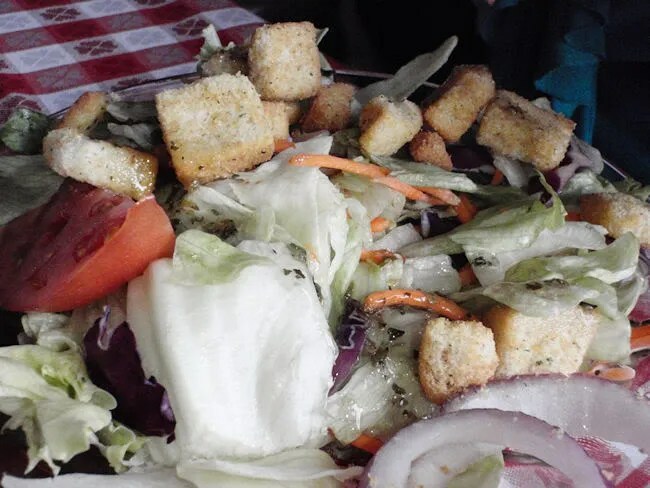 The salad was a simple salad with iceberg lettuce, croutons, tomatoes, onions, carrots, and cabbage. It looked a lot like the kind of salad you buy in a bag at the store. J didn’t really care. She was hungry and said it was yummy. 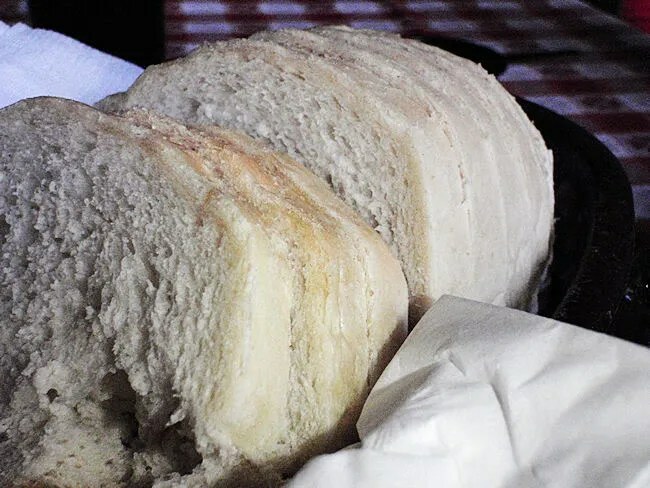 The bread is a soft Italian loaf. It’s served with a plate of Italian seasoning and there is Olive Oil on the table. By the time the bread came out, it had been over a half hour since we walked in and we were both getting hungry. J liked that it was soft and that there was a plate of Italian seasoning. For dinner, we both wanted pizza. The thing with Alamo’s pizza is that there’s only one size. The pizza comes only in a 12″ size and it’s a thin crust so we knew there was no way one pizza would satisfy both of us. Not a big deal. We just each order a pizza that we want. As we did this, the waitress warned us that it had been taking a long time for food to come up. Turns out, there was a “90 top” in the other room. In layman’s terms, that’s a party of 90 people. The kitchen was swamped trying to get their food out. That’s why service, up to this point, had been so slow. Apparently, we picked a bad night, but I’m sure a group of 90 had to make some sort of reservation….staff accordingly. Anyway, our pizza didn’t take all that long. It was about twenty minutes when the waitress came out with two silver pizza pans and set them down on our table. I had ordered a pepperoni pizza. J ordered a plain cheese. The first thing we both noticed was the crust. It wasn’t cracker thin. It was paper thin. I have no idea how they get it so thin you can almost see through it, but we both got excited about the prospect of what this pizza could be. I picked up and once you do that, you figure out how you have to eat this pizza. While it’s a super thin crust, it’s not a crispy crust. It’s very limp which did disappoint somewhat. I was ok with it though. To me, it just became a NY style slice. Break in the middle and go fold it over. I was happy with that. The pizza had a freakin fantastic taste. The edge of the pizza had a crispy crust and the sauce is just a little sweet. It’s topped with an Italian spice mixture. I tore through my pizza in no time. I couldn’t stop. J liked it, but really wanted a crisp bottom crust. Like I figured, one pizza was not enough for the two of us. I ate all of my 12″ and J ate half of hers. The other half is in the fridge and she’ll probably get it for lunch. Our bill was about $27 and we weren’t charged for the bread like we thought we were going to be. If it was done on purpose, it was a nice gesture considering the problems we had at the beginning of the meal. As that large group cleared out, things settled down and got back to normal. 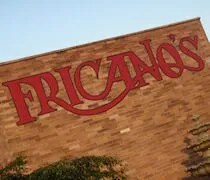 If I had to sum up our trip to Fricano’s of Alamo in one sentence, I’d say the night started off bad, but ended with some excellent food. I really liked the pizza. Really liked it. It’s probably some of the best I’ve had in Kalamazoo. It’s kind of a drive from our place on the south side of Kalamazoo, so we wouldn’t be regulars anyway, but it is a good destination dinner…as long as they don’t have an obnoxiously large group. That’s funny. I’ve done that home before….I’m sure it works better than a pizza cutter on such a thin crust. I told ya it was good! I really like Fricano’s, too. The Grand Haven location is still worth checking out, as it’s in something like an old house, so it’s kind of weird. Actually Fricano’s in general is kind of weird. You didn’t mention the fact that they only have five toppings, and onions are NOT one of them! I hate onions so I didn’t even notice. 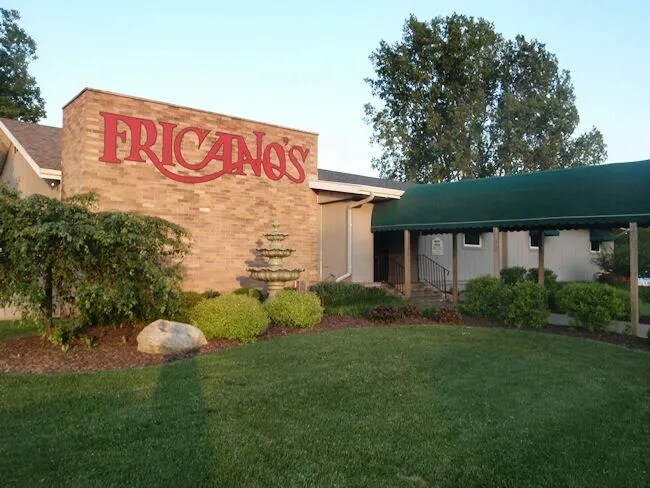 I grew up in Grand Haven during the summers and have been eating Fricano’s my whole life. The cust can come out soft sometimes. Mostly this happens on a really packed night. I always have them cook the pizza well done. This way the bottom is always crispy. The Alpine location is just as good in quality and service. There are two other pizza places in GH that you most try. Mr. Scribs and The Clover Bar. Mr Scribs is just like Fricano’s but they have different size pizza’s and more toppings to pick from. The Cover Bar is just great thin crust pizza. We as a family have visited your restaurant for many years. We had a large party of 10 adults and several children order food, pizza and drinks at your Alamo location. After complaining about the lasagna we asked to return it and order a pizza. Your Manager Kelsey’s refusal of a simple removal of a 10.00 item from a large bill resulted in all 10 people at our table very dissatisfied and angry. We will not be back and after speaking with several other parties listening to how your Manager talked to us, they also said they will not be back. Your Manager is very inexperienced and lacks any customer service skills. To the credit of the Owner of Fricano’s on 6th St. he did call us to apologize. Vicki – This blog doesn’t belong to the owner of Fricano’s, so why are you directing your ignorant comments here? This is just another customer’s blog… clearly you don’t read well. The pizza is excellent, I love the view by the windows but the service there is absolutely HORRENDOUS.. This coming from a bartender/server who’s been in the business for more years than I’m going to admit… Excellent service can make up for a mediocre meal.. But beyond ridiculous service can ruin an otherwise spectacular meal.. Imo.. I think they need to retrain, rehire.. Something!